Well, that was fast. Less than an hour after Senate Bill 4 made it back to the Senate after it was passed in the House, Gov. Pat McCrory signed it into law and then recommended his chief of staff’s wife as an appointment to the Industrial Commission. The outgoing governor has not responded to multiple requests for comment about the special session, and there had been speculation about whether or not he would sign legislation that came from the surprise fourth special session of the year. House Speaker Tim Moore made the announcement that the bill was signed. The bill will create a bipartisan Board of Elections and ethics agency, reestablish partisan elections for the state Supreme Court and Court of Appeals, modify the appellate court process and allow McCrory to fill a vacancy on the Industrial Commission. Yolanda Stith’s name was put forth a short time later in the Senate session. She is currently the Executive Director at North Carolina Association Long Term Care Facilities and the wife of Thomas Stith, McCrory’s chief of staff. She was previously a lobbyist. Democrats steadfastly voted against Senate Bill 4. They also voiced their opposition and concern about everything from the timing and the power grabs to partisan judicial elections and adding a layer of appeal. Senators and Representatives also spoke boldly about their disdain for the special session as a whole. Sen. Jay Chaudhuri, D-Wake, said it was not democracy at work, but despotism. Neither the House nor Senate have adjourned yet. If he wants to do something that has been sent through his office thousands of times, then he should approve and sign off on banning Gun free zones and backing the 2nd Amendment and give all CCW carry everywhere status as discussed. 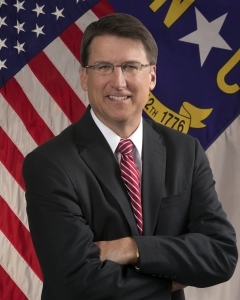 Soon to be Ex Gov Pat McCrory is a sore loser, big baby, just discusting man. He uses conspiracy theories to rule in his elected state. I have never seen such a big baby, when it comes to being voted out!! To cost to State millions and millions of dollars that would help the economy by people earning wages. Because of his bigoted views on people that live alternative lifestyles. This man needs to disappear into history and never show his face again ever!!!! Blatant power move; obviously these elected officials do not care about democracy. What an embarrassing moment for NC. They have no shame but I suspect this will haunt them in future. Former Governor. Beverly Perdue was RIGHT about Mr. McCrory before she stepped down at the end of her time in office. Citizens were offended by her remarks. We owe you one, Madam Governor! Funny how time will show us the real truth.